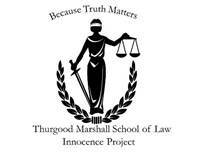 The Thurgood Marshall School of Law Innocence Project (TMSLIP) was created in June of 2007. In March of 2009, the Innocence Project began operating under the auspices of the Earl Carl Institute for Legal & Social Policy, Inc. The Project promotes student development through a clinical experiential model, where its students, under the guidance of a full time supervising attorney review and pursue actual innocence claims. Like most statistics associated with our criminal justice system the problem of wrongful conviction impacts the African American community more than any other. The reflection of disparate impact on the African American community is caught in Texas’ DNA exonerations; of the first 45 persons found to be wrongfully convicted, based on DNA tests, more than 80 % are African American. If you would like the TMSLIP to pursue an actual innocence claim on your behalf we require two things. First the case must meet the definition for actual innocence, which generally means that there was either: no offense; or if there was an offense someone else did it. And secondly, that there exists or potentially exists new evidence that would conclusively prove innocence (evidence admitted previously is generally not enough). Our Project also requires that the crime have occurred in Texas, and that the conviction has become final, and so we do not take trial cases or cases that are still on direct appeal. TMSLIP currently has more than three thousand requests for assistance, therefore processing requests for assistance and beginning any investigations can take months. Individuals claiming to have been wrongfully convicted may make a formal request for assistance by completing a TPIQ (Texas Prisoner Innocence Questionnaire) and mailing it to the Thurgood Marshall School of Law Innocence Project, Earl Carl Institute for Legal and Social Policy, Inc., 3100 Cleburne St., Houston, Texas 77004. TPIQs are also generally available in each prison library. The TPIQ should be completed as fully as possible and be legible. We use the TPIQ to make an initial determination on whether your claim would meet our requirements and failure to fully complete the TPIQ legibly can result in a delay of processing and / or denial of your request. Status Update: To check the status of a pending request for assistance click here. You will need your ECI case number.